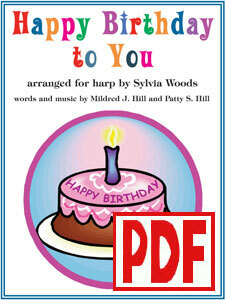 This product is a PDF download of the printed sheet music of Happy Birthday arranged for the harp by Sylvia Woods. Happy Birthday to You? Now you can play it on your lap harp, lever harp, or pedal harp! This PDF is 11 pages long, including 8 pages of music and 1 page of performance notes and important information.